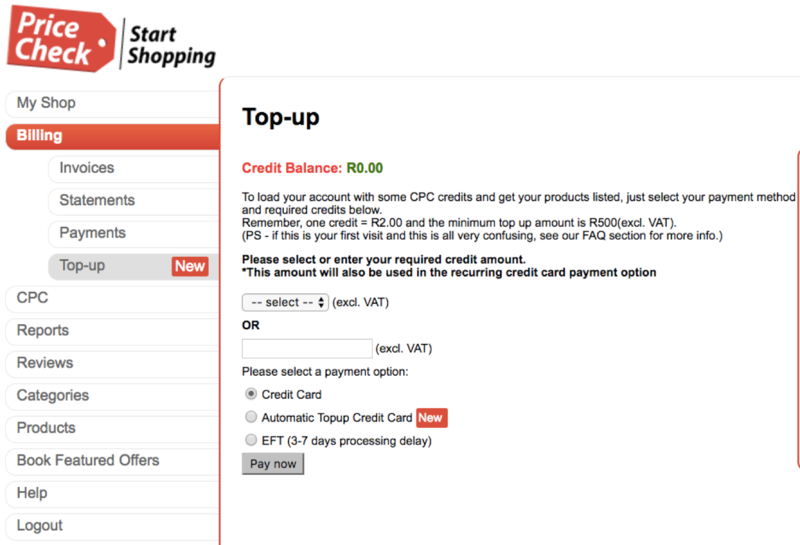 To keep your account topped-up you are able to use your credit card on your dashboard. Top-ups can also be done via EFT which requires a proof of payment to be sent to accounts@pricecheck.co.za. However, we recommend that you use your credit card to ensure your credits are automatically added to your account and it remains online. In your Dashboard, in the Billing section, click on Top-up and follow the instructions. If you wish to set auto top-up, please consult our Knowledge Base. When doing the payment, please ensure that you use your Shop ID as the reference and that the POP is sent to accounts@pricecheck.co.za. Our Technical Account team will then allocate the funds to your account, and run an update for your feed. Your store will be set live once this has been done.